There’s that old saying that nothing in life is certain except death and taxes. Well, I’d like to suggest a parent’s update to that: nothing is certain except death, taxes, and diapers. Endless, endless diapers. No day with a new baby is ever quite the same, but no matter what your little one throws your way, you can always count on them needing you to pitch up with a fresh diaper and no judgment. You love your baby, I know, but you might not love the endless conveyer belt of poop they seem to generate for you. Changing tables are designed to make the whole diaper process stink just a little less. A good one is like your changing battle station, with everything you need to conquer diaper duty conveniently stored at arm’s length. We’ll break down whether you really need a changing table, exactly what you should think about before purchasing one, and which models we think are the best that money can buy. Use the links above to check the latest prices or read our in-depth changing table reviews below. How Much Space Do I Need for a Changing Table? What Should I Store in My Changing Station? The first thing you should do when choosing a changing table is to be realistic about how much room you have to work within your home. Consider whether the baby will have their own room or will be sharing a room with you. And if they do share with you, for how long? The initial setup is likely only to be temporary, and you should be expecting some changes to occur after a few months (source). If you’re planning to give your baby their own room, either immediately or at some later date, it’s a good idea to establish a clear map of that room before you start piling everything into your Amazon cart. A changing table takes up as much room as a bookcase, but if you get one with built-in drawers or cupboards, you could actually end up giving yourself more storage space. For many parents, a combination dresser and changer is great, even if they’re not that short on space. These allow you to remove the changing portion as your child grows, so you can use the same piece of furniture for years to come. Height: Changing tables are not a standard size. Choose a height that will match the proportions of the person who most often does diaper duty. Versatility: Don’t just look for the features that will serve you right now; consider what you can use your changing table for in the future. Some tables can convert into a toddler’s dresser, a simple table or shelf. Price: While convenient, changing tables are not 100 percent necessary, so ask yourself what your budget will allow for. Cleaning: A new changing table may look pristine and white, but consider that it’s liable to get dirty with time. You’ll want something you can clean thoroughly and easily. Mobility: Today you can find baby furniture specially designed for caregivers who rely on a wheelchair or have other types of physical limitations. Style: While not a huge issue, look for something you like that matches your nursery decor. Light colored, minimalist designs are most versatile and can be used for both boys and girls. Safety: Look at any candidate changing table carefully and consider how easy it would be for your baby to roll off it. While they should only be there supervised and during a diaper change, accidents happen. Are there any sharp edges, loose pieces or things for your baby to grab and pull down onto themselves? Unlike other pieces of furniture you’d buy, a changing table is primarily about function. If you end up using yours 5 to 10 times a day, every day, you’re going to want a hard-working piece that helps you get things done and makes your life easier. Not all brands out there are going to work for you, but the right one will have you re-diapering your little one with the speed and efficiency of a Formula pit-stop. More and more parents are opting to go with the environmentally friendly and cost-effective option of cloth diapers. If you’re planning on going with cloth over disposable diapers, there are some special considerations when choosing a table. Using cloth diapers requires a few extra supplies, which is why you'll need a table to store and organize it all. This Graco model is a great option for parents who use cloth diapers for their children. It has an open, two shelf design which provides plenty of flexibility for storing all of the supplies necessary for cloth diapering. You can use the baskets to hold diapers, liners, wipes, and creams, and there’s space to fit a small pail for the used diapers. It has a simple, but quality appearance. The pebble-gray color is versatile enough to work in most nurseries. It even comes with a waterproof changing pad, with a safety belt. What makes it perfect for cloth diapering is the high sides. This feature, along with the safety belt on the changing pad, should provide parents with some peace of mind while they’re focusing on getting rid of that dirty diaper as fast as possible. Two tall open shelves for storing supplies. You’ll probably have to purchase extra storage baskets to keep your supplies organized on the open shelves. A few parents found the changing pad to be somewhat thin, so they purchased a thicker replacement one. Take out the stress of assembling baby furniture with this completely adorable changing table from Delta Children. It doesn’t take a lot of time to put together and all the pieces and tools you need are included with your purchase. This means you get to spend more time focusing on the important moments. Don’t worry though! Easy assembly doesn’t mean there’s a lack of safety or sturdiness. The four high sides and safety strap keep your little one from rolling out. The beautiful finish is even non-toxic. All together, this changing table includes two open storage shelves, a waterproof changing pad with an attached safety belt, and everything you need to put it together. We are especially in love with the cute design, making it perfect for any nursery. Once assembled, the changing table is just over three feet high, so it is a little low. Taller parents may find themselves bending over during diaper changes. Super cute design will compliment any nursery. All tools and parts are included and assembly is easy. Includes a changing pad with safety belt. It’s only 3 feet tall, so taller parents may have to hunch a bit too much. Is your style more warm and classic than bright and bubbly? 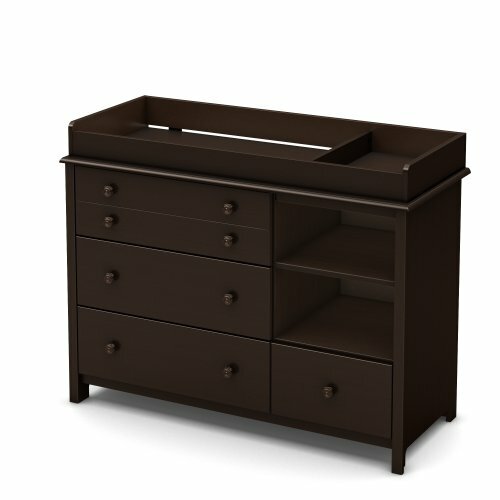 Help create a sleek nursery with this beautiful dark-colored changing table from South Shore. Not only do you get the style, but multiple features contribute to its functionality. 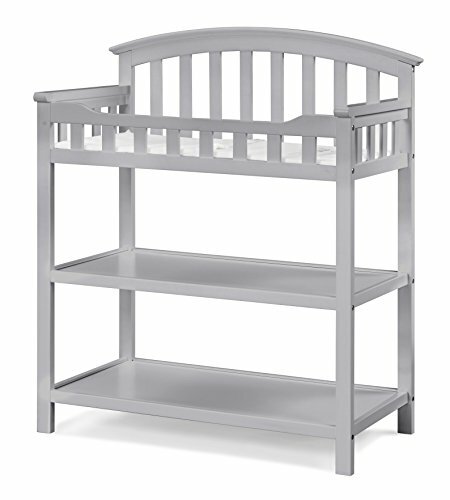 The top of the changing table features rounded contours and a secure front panel for added safety. Beneath the changing area is ample storage space. You get two open storage spaces separated by a detachable shelf and four drawers in two different sizes. With woodness knobs and an illusion drawer, this changing table is a beautiful addition to any nursery. However, the top can be removed and the entire piece converted into a regular dresser or storage unit. This functionality allows it to look great in any room, which is especially good for moms short on space. One drawback is the lack of tools and accessories. It doesn’t come with a changing pad or mattress and you’ll need to get your own tools and another adult helper to assemble it. 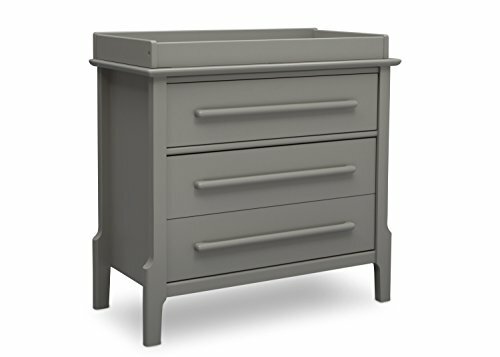 Classic dark finish is perfect for traditional moms wanting a changing table that will look great anywhere. Convertible top allows you to use it for years to come. Does not include a mattress or changing pad. Advanced assembly required and no tools are included. With a simple and clean design, this changing table looks good with any theme you can come up with while making the messy task of changing a diaper just a little easier. It features three storage drawers, a separate storage cabinet, and a removable changing tray. The cabinet has an adjustable inner shelf and the drawers roll out smoothly on the metal glide tracks. Plus, the mechanized stops will keep any child from pulling the drawer out all of the way. One thing we really appreciate is the included anti-tip kit. Furniture can be scary if it isn’t secured properly. The anti-tip kit will keep the entire changing table anchored down so it won’t fall on top of your child. If you hate mess and clutter, the extra room combined with the clean look will keep your nursery organized. Along with the safety features, this changing table is a great choice for any mom. Minimalist design looks great in any nursery. Includes an anti-tip kit as an added safety precaution. Removable changing tray extends life of the piece. Moms have noticed there are often white chip marks in the delivered pieces. Although some days it seems like you'll be dealing with diapers for the rest of your life, your child will really only wear them for the first few years. A changing table will not be very useful once your child graduates to using the potty, and that's why purchasing a combination table and dresser might be a better long-term option. The DaVinci Autumn 4 Drawer Dresser provides a versatile way for parents to combine two pieces of furniture into one. This clever combo features a removable changing tray that fits over an ordinary chest of drawers so the unit can be refashioned as a dresser once your child gets older. Also, since the changing tray attaches to the back of the dresser, it will not leave any visible marks on the top area once it’s removed. 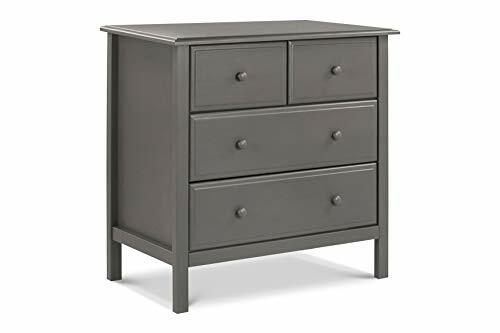 You can purchase this in either slate, espresso, or white, and the drawers have sturdy metal glides so you know they’ll last a while. There are two smaller drawers on the top, which can be used for diaper-changing supplies, and two large ones which may come in handy for clothes or toys. Parents who like the look of this item can purchase a matching crib, full dresser, or bookcase, all of which can be restyled as your little one grows up. Great safety features, including an anti-tip kit and a stop mechanism on the drawers. Most parents found it to be very sturdy. Several parents complained that the assembly process was difficult the instructions poorly written. You have to purchase a changing pad separately. Babies go through a lot of diapers (now there's an understatement). You probably don’t even want to start adding up the total hours that you spend changing them. For those parents who are taller than average, awkwardly craning over their baby to change diapers can start to feel like back-breaking work. You don't need to suffer though: look for a table that's the right height. The DaVinci Jenny Lind stands a full forty inches in height. Made out of high-quality cherry wood, this is one of the taller changing tables available, providing lower back relief for those parents who’d otherwise be bending over to tend those dirty diapers. It comes in a clean, white color and has a classic design with spindles. A quality changing pad is included, plus there’s a safety strap and two large, open shelves for you to store all your diaper-changing accessories. 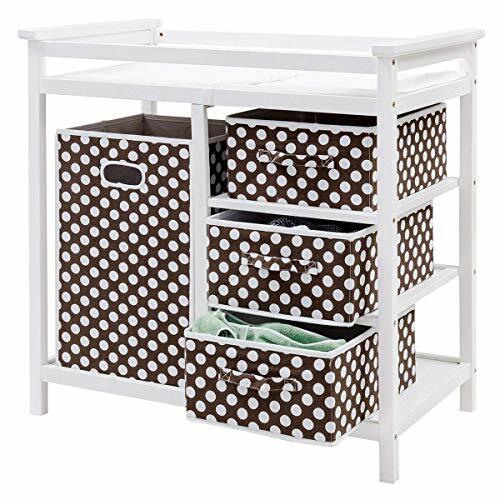 These shelves are sturdy with reinforcement braces underneath each level, and you can use a variety of different sized canvas bins on them to organize your powders, creams or diaper snaps. 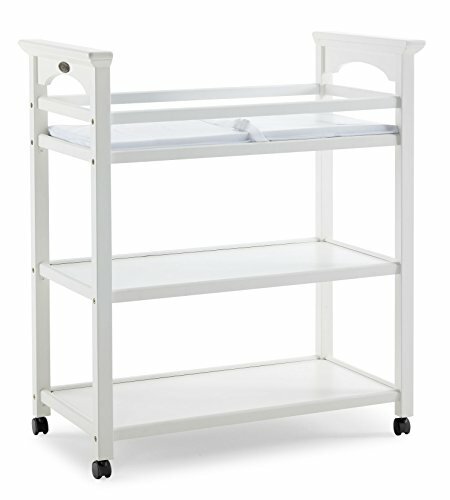 While this unit is sturdy, it’s still lightweight, so it can be easily moved around the nursery. The bars on the top enclose the changing area on all four sides, for extra safety. Includes an anti-tip kit for securing the changing table. One of the taller models available. A few parents found that the painted finish chips off fairly easily. You will probably have to purchase some storage baskets to keep all your supplies organized. When it comes to planning out your baby's room, you may have to work a little magic with items that are space-saving and multipurpose. Babies need a lot of gear, and you'll have to find creative ways to store it all. Combining your changing table with another handy feature means you not only save space, but you also keep everything you need in one convenient place. This Costzon table is not just super affordable; it also contains loads of storage space that can be used in many different ways. Unique to this unit is the tall hamper on one side, which comes in handy for dirty laundry, bulk bags of diapers, big toys, blankets or even a diaper disposal unit. The top of the table comes with ample safety rails all the way around the changing area, plus a belt to keep your baby secure. The non-toxic finish is wipe-clean and the entire piece is simple enough in design that it will happily fit in any nursery. The other three drawers are generously sized and will accommodate any diapering necessities you have, and more. There’s a wide range of colors to choose from, and the designs on the hamper and drawers are an easy way to add a cheerful pop of color to your nursery. Hamper and drawers come in solid colors or cute patterns. The quality is not that great. May wobble and move under a baby’s weight. Some babies don’t come home to a large room all to themselves. For families who live in apartments or have other issues with space, it can be hard to find room for a changing table. If this is your situation, you should know that there are options besides leaning over a bed or getting down on the ground to change a dirty diaper. The Badger Basket Diaper Corner is an innovative solution for small spaces. It’s designed to fit neatly in the corner of your baby’s nursery without hogging too much room. 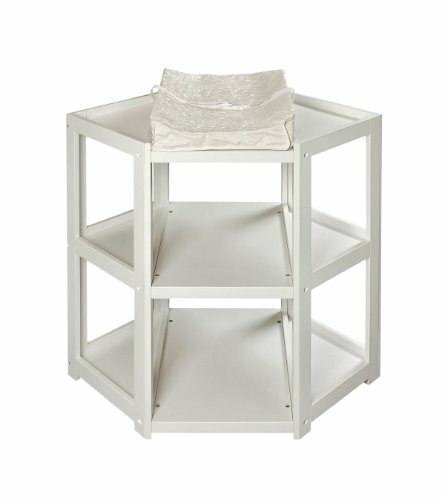 You change diapers with the baby’s feet facing you, with shelving on either side of the baby. 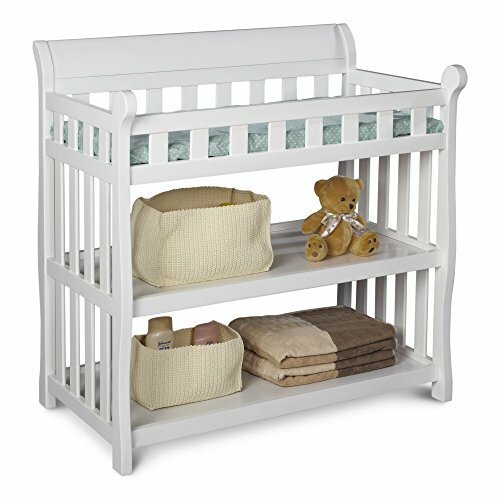 It comes in a white, natural, or cherry, so you can easily coordinate it with the other furniture in your nursery. In addition to the shelving on the side of the changing area, there are two levels of open storage. This model provides quite a bit of space for keeping diapers, wipes, and everything else you could possibly need for changing your baby. It comes with a contoured changing pad, with a terrycloth cover, and a safety belt. The changing pad actually screws to the table, so you can be sure it won’t slide around. Parents love the shelving on either side of the baby, both for convenient access to supplies and an added sense of safety. Takes up minimal space in the corner of the nursery. Many parents mentioned that the included changing pad is pretty flimsy and doesn’t last very long. It may be difficult to find baskets or bins that fit well on the shelves, but there are some available from the manufacturer. 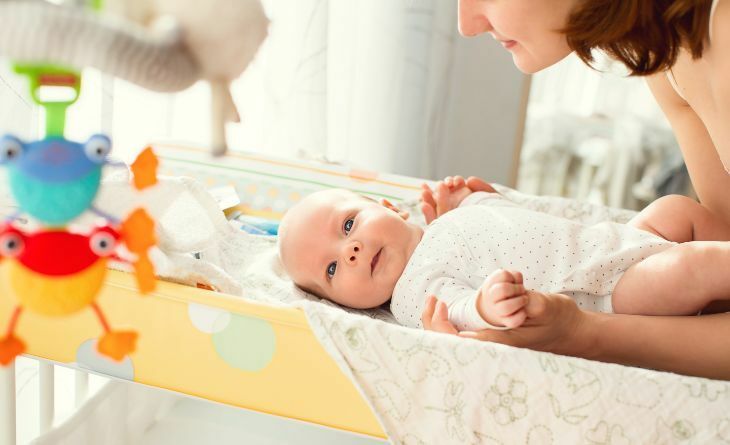 Some parents may say that a changing table is completely unnecessary baby gear, but having everything that you need in one convenient location can make the unpleasant task of changing diapers a little more bearable. What are your options if you like the idea of a little extra convenience but don’t want to spend too much on it? The Graco Lauren provides a changing surface and two open shelves for storing supplies. It has a clean, basic design, with white painted wood. There is a safety bar surrounding the entire changing surface which is at a decent height, meaning parents won’t have to bend over too much to change their baby’s diapers. This Graco table comes with a one-inch changing pad and a safety strap to keep your squirmy baby in place during diaper changes. Unlike other tables, this one comes with wheels so that it can be easily moved throughout your home. Two of the wheels can be locked, so the table doesn’t move once you’ve found the right spot for it. It’s especially affordable because it can be repurposed after your child outgrows it. Reincarnate it into a bookshelf or a coffee cart. Parents found it easy to assemble. Versatile design can be re-purposed once your diaper days are over. Several parents thought that it was not very sturdy and said they wouldn’t trust it with a heavy toddler. The included changing pad is very thin. You may have noticed that it doesn't take all that much to convert an ordinary dresser into a diaper-changing table. If that's the case, why not save yourself a bit of money and convert a dresser you already have? There's no reason you need to spend a lot to get all-new items for your baby when a few clever adjustments to what you already own will do just as well. Sometimes the most elegant solution is the simplest one. A changing table is essentially just a raised, flat surface for you to change your baby on, and with this Delta kit, you can convert any flat surface to do the trick. The frame attaches to the back of your dresser or chest of drawers, and will work with any surface 35.5″ x 17.25″ or bigger. Assembly is quite easy, as there are just four pieces to join up. You can get creative with this kit since it’s up to you what color you choose, what kind of changing mat you want to include, or how large a piece of furniture you want to place it on. The great thing is you can easily remove it all when your little one is potty-trained and have your old dresser back again. Much cheaper than buying an entire unit. Can fit almost any dresser top easily, giving you lots of versatility. You’ll still need to buy a changing mat, and take care that it’ll fit. No actual bottom tray is included, only the external rims. This changing table is a beautiful item all on its own, and will make you feel like even though you bought it for your baby, you’ve also scored a really nice piece of general-purpose furniture that will last for years to come. The removable changing topper is a solid rim of wood to which you add your own separately bought changing mat. 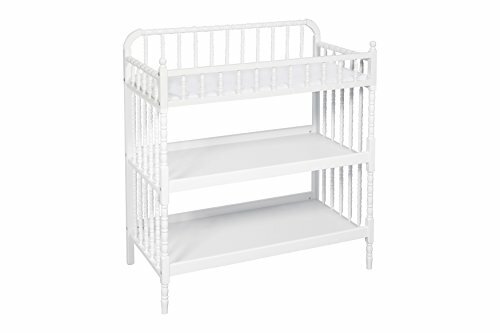 With three color finishes, you can find something to coordinate with the rest of the nursery, or else opt for the matching crib from this company, which is also very well made. The drawers are deep and roomy, and the entire unit is heavier than others like it, making it solid enough not to tip over when the drawers are opened. Long wearing, so the finish won’t chip after just a few months of use. Some assembly required, which parents have reported is a bit of nightmare. The changing tray can be dislodged by a very squirmy baby. Of course, you could always think out of the box and not have a changing table at all, but rather a changing shelf that stores flush against the wall when not in use. You'll have seen changing stations of this kind in public bathrooms, but there's no reason you can't have one in your own home, particularly if you're tight on space or simply don't want a bulky item. 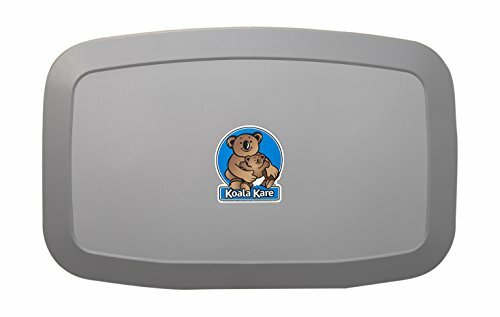 Firstly, don’t worry about this Koala Kare baby station being flimsy: it can safely hold up to 200 pounds, which is actually a lot more than many traditional changing tables. Made of a super-strong steel chassis inside the polypropylene, this thing isn’t going anywhere once installed, and has met multiple safety compliance standards. When closed, this sleek unit only sticks out around 4 inches from the wall, meaning you save a lot of space for other things. The material is easy to wipe down and gets the job done quickly and efficiently. If you’re a diaper-changing pro and don’t mind a no-frills solution, this might be your answer. Though the functional appearance and Koala decal are not the most aesthetically pleasing, you can easily tuck this station behind a door or remove the decal. Plus, you get to mount it at precisely the height you like. Comes with a strap, bag hooks and a liner dispenser for extra hygiene. Bed surface is made of antimicrobial plastic. Though you can try to DIY it, it’s better for a professional to install the unit properly and safely. You might not want something in your baby’s room that reminds you of a public toilet. Can’t be used with a soft changing mat. You definitely don’t want to be in the middle of changing a huge blown-out diaper when you run out of baby wipes! You’ll want to find a changing table that can store all your diaper-changing supplies, so they’ll be ready when you need them. What would you need to store in your changing table? Some of the most obvious things would be diapers, wet wipes and cream. Hair ties to keep your hair from getting in the way. Hand sanitizer for before and after. Distractions for your baby like toys or a pacifier (source). A replacement changing mat cover. Medicine, nail clippers or a thermometer. Diaper changing time is a great opportunity to quickly get a range of other little tasks done. Changing tables need to do much more than just provide an elevated surface for changing your baby’s diapers. Make sure you figure out how much usable storage they provide when making your selection. How you choose to organize your changing table will depend on the table size, design and your particular changing routine. Consider having a compact caddy containing just small amounts of the essentials and a few diapers to have readily accessible on the counter, while refills and extras are stored underneath. This avoids clutter, as you can just top up as you go. You can use any number of plastic, fabric or wooden organizer boxes to keep your items tidy, or repurpose cardboard boxes or other plastic containers for a budget DIY option. You can use diaper caddies, drawer organizers intended for socks or underwear, woven baskets or even bathroom or kitchen organizer units for smaller creams and wipes. Roll up towels, small clothes and changing mat covers and store them upright so you can see everything at a glance when you need to grab one quickly. Are there sharp corners that kids can run into? Is there a safety belt on either the changing pad or the actual table? Is there anything that would be in reach of the baby that could cause them harm? Does the changing table come with a kit to secure it to the wall? Furniture can tip over and fall on children. In the United States, forty children visit emergency rooms every day after being injured by heavy furniture falling on them (source). You never think it will happen to you until it does — so rather be safe than sorry. 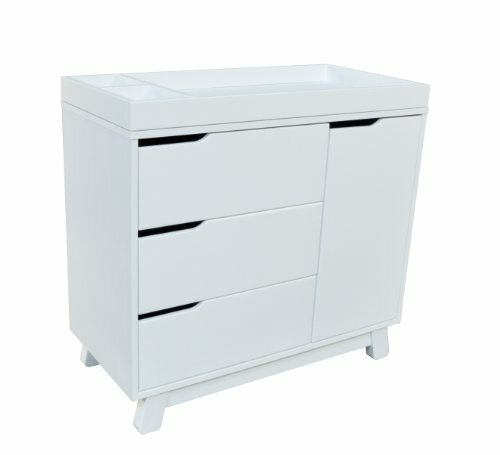 What Should My Changing Table Be Made Of? As with anything else, you pretty much get what you pay for. In shopping for children’s furniture, you have to decide whether to spend more for higher quality items or to settle for one of the cheaper options. One of the most important factors to consider when deciding how much to spend on a changing table is whether you plan on having additional children. A cheaper table should last through one child, especially if it’s just a changing station and not also being used as a dresser. However, if you want to reuse a changing table for multiple children, you’re probably better off going with a higher-quality one that will be more durable. The cost of a changing table will often depend on whether it’s made out of real wood or particle board. While particle board may look nice at first, it won’t stand the test of time. The laminate or veneer may peel away and the bottoms of drawers can actually fall out (source). If you’re looking for a changing table to use for an extended period (either with siblings or one to grow with the child), then you’re probably better off investing in a higher-quality table. How Many Changing Tables Do You Need? Will you be changing diapers for one or two children? Maybe you have siblings who are close in age or you could be having twins. Either way, you can only change one diaper at a time, so multiple changing tables are probably unnecessary. But they might provide some convenience if you live in a large house and you don’t want to run upstairs to the nursery every time your baby needs a new diaper. If you’re changing diapers for more than one child, you should probably focus on finding a changing table with a good amount of storage. This is especially true if you need to keep it stocked with diapers in more than one size. Can My Baby Sleep on a Changing Table? No. This should really never be an option, as a changing table is simply not safe for a baby to sleep on, supervised or not. There is too much risk for them to roll off and hurt themselves. How Tall Should a Changing Table Be? You want a changing table that allows you to do your thing without it putting strain on your back. If you’re tall you can go for a taller table, some of which can be up to 43 inches (or 3.5 feet) high. If you’re shorter, choose a shorter table to match. A good idea is to test a table out in store and get a feel for its proportions. If it’s too tall you’ll be pulling your elbows up awkwardly to change your baby, which will get irritating after your fifth diaper of the day. Don’t forget to factor in the height of the changing pad as well. Ideally, the highest part of the table should hit around hip height. Take some time to research and consider which option will be the best for you, and which will make your life that little bit easier. You may choose to go for an expensive, high-end item or decide in the end that you’re happy to do without one at all. First-time moms out there, do you have a dedicated baby changing station? If so, please share your table choice, your organization tips or any other advice you have in the comments below.